The final link in the chain of high-fidelity engineering - and often overlooked - is documentation. As quality-consciousness percolates across the chain, this is an area that we feel we can help in. Hi-Tech works with Customers across the complete life Cycle of Product helping them not only with the enabling Technology but in creating entire gamut of Technical Documentation content. It might be errors in a manual due to communication issues, the frequent updation cycles for a manual or wanting to present sales ideas fast and powerfully - going digital can be a solution. Technical Documentation is a specialised skill which relies on the experience in a specific trade or industry sector to write descriptive and procedural text to an established or bespoke specification. All of our technical team mebers are experienced in one or more sectors. 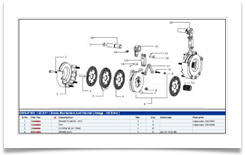 We work with engineers and designers as necessary to combine customer's existing information and produce technical publications to the required specification. These publications may include (but are not limited to) descriptive text, maintenance procedures, illustrations, parts lists and visual animations. All publications are produced using software appropriate to requirements. Throughout the process, close liaison is maintained to ensure that product is delivered on time.